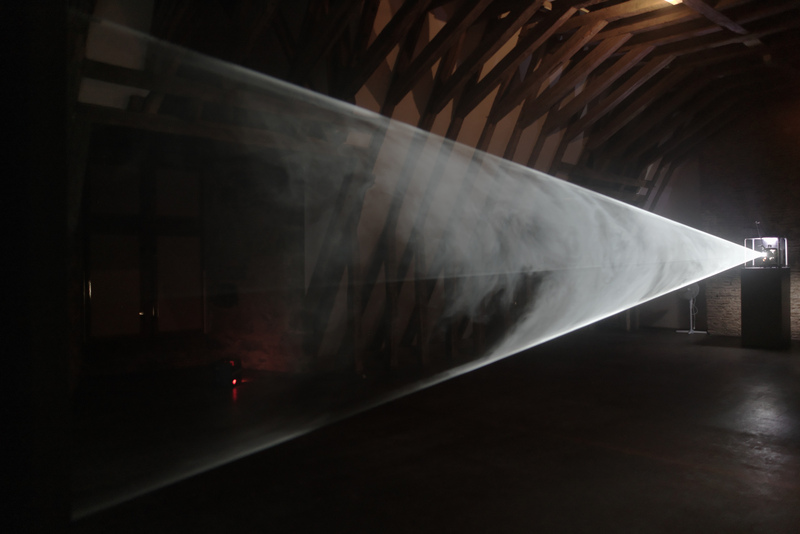 While I’m on the subject of almost non-existent sculpture, especially almost non-existent sculpture that might in some way be seen as drawing, it’s perhaps inevitable that Anthony McCall’s Solid Light Works should worm their way into my thoughts. I can remember the first time I saw Line Describing a Cone very clearly indeed. It’s just one of those works: astonishing, engaging, playful, uplifting even. There’s something about the way it plays tricks on both eye and mind. That first encounter was at an almost deserted Hayward Gallery – it was about two days before Christmas, which turns out to be a great time to see art almost in private – in the exhibition Eyes, Lies and Illusions which brought together a collection of magic lanterns, zoetropes and other optical devices with works by contemporary artists. It was a great show. And then, there was one final room just before the exit. When I went in it was empty and, my friend and me aside, it stayed that way for a good five minutes or so. I think it’s pretty clear by now that I quite like a bit of visual confusion and that I have a bit of a soft spot for the large scale minimal sculpture made in particular by American artists in the 1960s and ’70s (and later), which means Fred Sandback is definitely right there on my like list (even if I do have a tendency to forget his name from time to time, possibly, for some weird reason, I don’t expect artists to be called Fred). This is sculpture at its simplest. 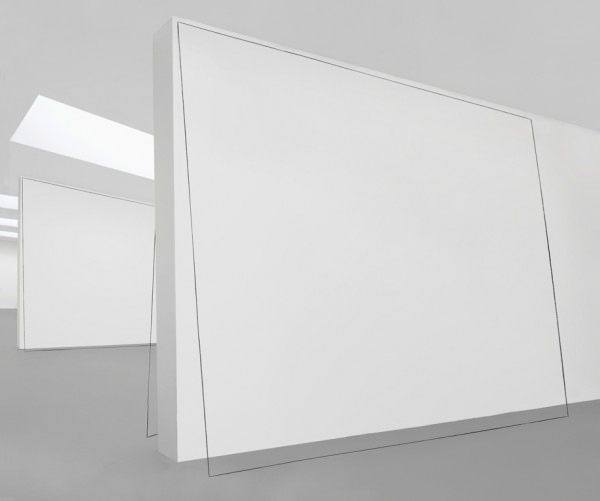 Sandback makes works that divide the space or rest against a wall. At first glance, it usually looks like there are large sheets of glass either creating barriers in the space or resting against the walls. but all is not as it seems..
Of all Gerhard Richter’s work – and his practice is unusually varied – it’s probably his exploration of the relationship between painting and photography that interests me most. But I’d struggle to come up with a body of work by Richter that I don’t like, though I guess the 1980s’ squeegee paintings would probably be on the list if I tried – the colours just don’t work for me – though I love the later squeegee paintings. 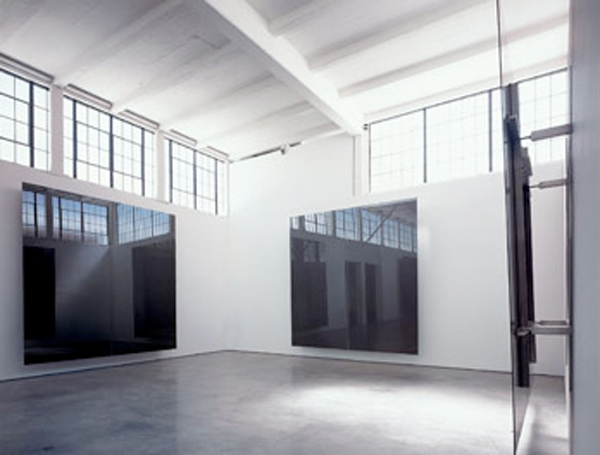 I’m often unsure quite where I stand when it comes to Richter’s work with mirrors and glass. I like the work, but the paintings are so amazing that the other works can seem irrelevant by comparison. But, like most art, it depends on the context. Dia:Beacon is an extraordinary place. A former factory converted to display the Dia Art Foundation‘s collection of works from the last half century or so in appropriate surroundings, the industrial architecture is put to good use to provide some unusual and unusually large spaces to show the work. Many of the works housed here can’t easily be accommodated elsewhere. The collection – much of which was acquired in the 1970s and ’80s – contains work by many key late twentieth century artists – primarily but not exclusively American – with industrial scale sculpture particularly well represented; since the 1990s works by other artists of broadly the same generation have been added to the collection including Gerhard Richter’s Six Grey Mirrors. There was a time when SoHo in New York City was full of artists. Space was cheap and artists like Donald Judd bought whole buildings to live and work in; the area was full of studios and galleries. Gradually both have dispersed. The galleries have moved north to Chelsea and to find artists’ studios in any real density it’s probably necessary to head to Williamsburgh in Brooklyn. If you look closely, there are still traces of the old SoHo among the designer stores, hotels, bars and restaurants though. Judd’s home and studio is still there at 101 Spring Street, now owned by the Judd Foundation, and will be open to the public once the building restoration is complete. Artists Space has moved several times in its forty year history but remains in SoHo, on Greene Street. 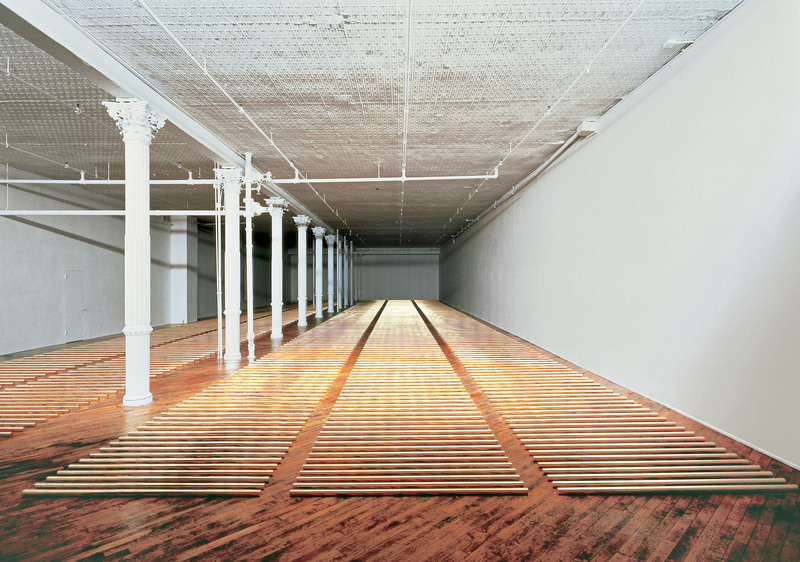 Also tucked away in SoHo are two long-term installations made by Walter De Maria in the 1970s, maintained by the Dia Foundation and still housed in their original locations. Both define the spaces they’re housed in, both fit with some of the themes of American sculpture of the late mid-twentieth century such as the use of non-traditional materials and processes and a minimal approach that is rooted in geometries and measurement. When it comes down to it, one pile of bricks is pretty much like another. At least, that’s the way things work in Carl Andre’s Equivalent series. Each of the eight sculptures in the series consists of 120 bricks laid out on the floor two layers deep. Though each is laid out in a different arrangement, as each contains the same number of the same type of bricks, each occupies the same volume of space and can therefore be seen as equivalent. 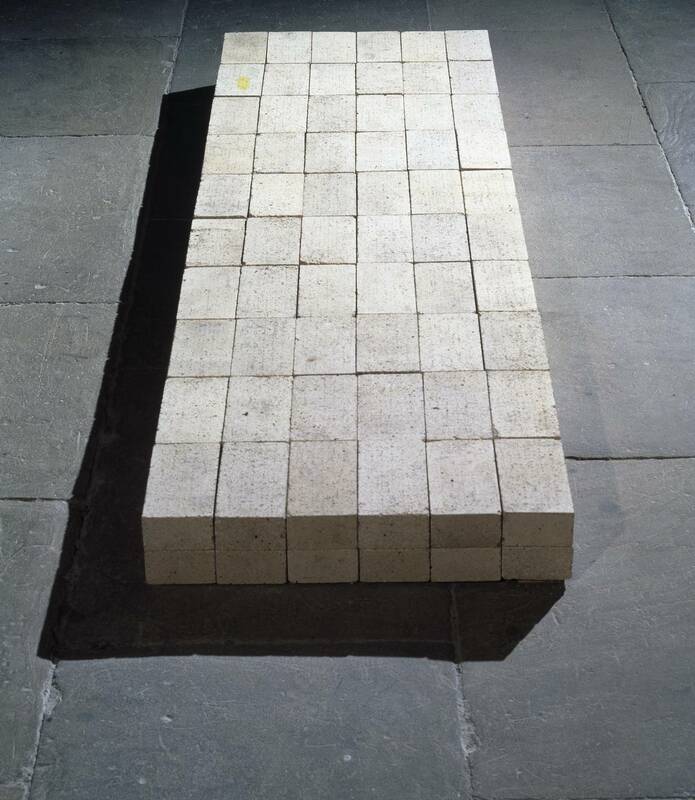 Equivalent VIII, bought by the Tate in 1972, is described as 2 high x 6 header x 10 stretcher; in other words the bricks are in two layers each six bricks wide by ten bricks long. The work is probably more commonly known as the bricks, or perhaps the pile of bricks, and has long been one of the most controversial artworks held by a British art museum. Though historically sculpture might have been rooted in the figurative and decorative, clearly from the point at which Marcel Duchamp declared readymade objects to be art, all bets were off about what could become sculpture and how and why this might happen. And, along with readymade objects, industrial materials and processes have long been legitimate territory for artists. 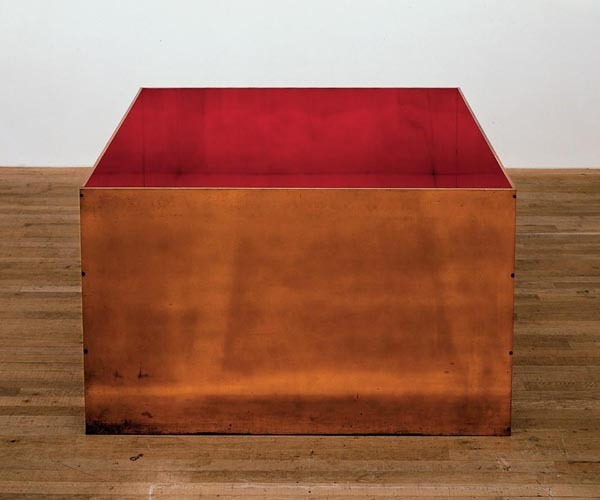 Like other artists broadly known as minimalists – though it was a term he rejected – Donald Judd focused his attention on the inherent qualities of his materials which he used in a simple, straightforward way making ambiguous works that act as sculpture but often seem, in some way, closer to functional objects. 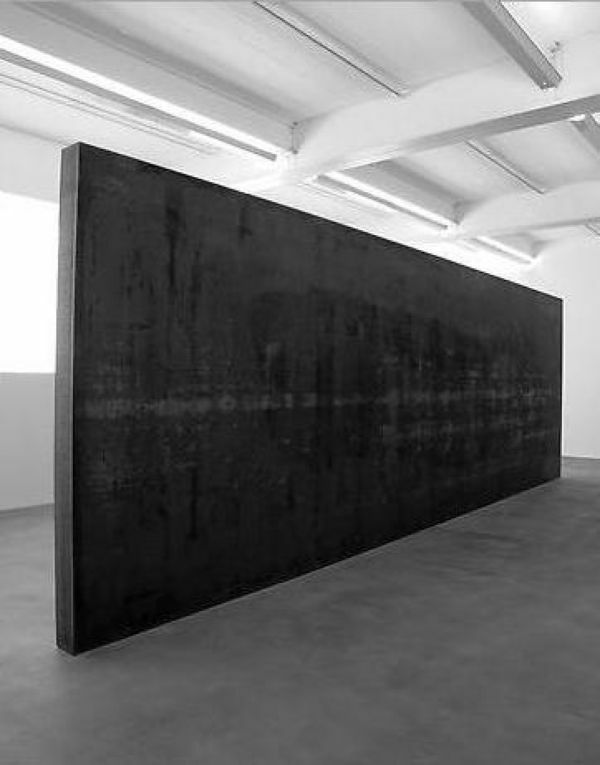 Richard Serra’s sculptures scare me. Well, sort of. When I stop to think about the weight of steel and the way they just stand there minding their own business but capable of crushing anything in their path should they choose to fall, then they scare me. Mostly I just kind of marvel at the scale of them and at the quiet way they hold their immense power in check. Though I really liked everything in Serra’s exhibition at Gagosian in London in 2008, ultimately for me it was all about two works. The first of these, Fernando Pessoa, is a simple wall of steel. It just stands there, unsupported. The wall is ten inches thick, any less and it would be at risk of toppling over. As it is, it just looks like it could fall. It’s an extraordinary presence in the space, bisecting the room but becoming almost nothing when seen end on.